A new "report" of data intended to be used as propaganda, in this case against foods that are NOT genetically modified, a company called Stericycle has produced data that it says proves organic food recalls are up. The news of the report, of course was recently spread by the U.S. corporate media as a subtle propaganda campaign to directly condemn organic foods in hopes to offsetting consumer growing confidence and demand for organics. All no doubt to the delight and support of GMO food producers like Monsanto. "Today, we operate in Asia, Europe, North America, and South America, and employ more than 18,000 people worldwide. Our primary business in each of these markets focuses on providing integrated solutions for the management of medical wastes." It is thus in their interest for people to use hospitals and remain sick since they are deeply intertwined with the profits surrounding hospitals and sickness. And just like that Pollack leaves it to the U.S. corporate media to spread the propaganda from there. The propaganda here is subtle and transparent to anyone not paying attention, but is quite obvious to anyone who is. The message being conveyed here is that genetically modified foods are somehow safer than organic foods and that organic (non-GMO) foods are becoming increasingly "dangerous"! Let's consider a few things. Let's all remove our Orwellian hats for a moment. First, there is no such thing per-se as "organic" food. We all call it organic, but more importantly it's natural and it's real. Everything else that is not real, natural or organic is fake, genetically modified, synthetic, or not real. Sadly the GMO psyop is so deep today that the control system has everyone thinking that genetically modifying things is a normal thing to do and somehow not genetically modifying things open you up to danger, illness, death and destruction. As we review the first level of this secret pro-GMO psyop we consider that the first intent of this propaganda piece is to make that "weird" special category of food called "organics" seem like it perhaps doesn't belong in our world. It's the culprit of bacterial spreading and it is therefore a problem for humanity. Organic foods are being painted as somehow bad for you. The second level of this pro-GMO psyop is that once the problem is offered- "organic foods are responsible for spreading bacteria"- then we must come up with a solution. That solution of course, not mentioned here is to perhaps cut down on organics, or maybe get rid of them all together. The replacement problem-solving food of course is genetically modified foods, the one with the tiny microscopic labels that no one can read with the paragraph sized list of ingredients of things most of us can't pronounce. The third level of this pro-GMO psyop is that nowhere in these corporate media stories or in the issued report are the dangers of GMO foods mentioned. Let's not forget that GMO foods are banned in many countries and for good reason. That's because genetically modified foods are dangerous. Yet these dangers are completely ignored to the delight of Monsanto, Syngenta and other GMO giants. Health and safety is not something to debate. I would rather risk a self-limited bacterial infection which a healthy immune system can take on, than to alter my DNA and ingest a cancer-causing and other chronic human disease-causing food. The fact is that outside of nature's natural "organic" foods there are no safe choices. The truth they don't want you to know is that all GMOs should be banned forever. This is about science, health, common sense and morality. The controllers layer these deceptions and then point you in the opposite direction. 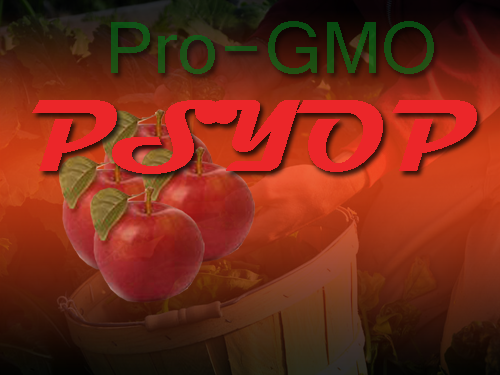 So instead of looking at the GMO problem they want everyone instead fearing organic foods. Have you considered that perhaps this is the very early stages of a future aggressive campaign against organic foods? Have you considered that perhaps this is a propaganda beta-test to see how people react to the story? I believe this is very possible. These subtle stories usually grow in size later on. Perhaps later on they'll stage a massive "out-break" to be blamed on "organics". The public would then be forced (vaccine-style) to eat GMO foods. Imagine that! Remember the measles outbreak psyop of 2014? We all saw how it morphed into forced vaccination bills (SB277) in states like California, which if it sticks will surely be a template for an attempt at a federal mandatory bill. Don't forget the measles story came out in small sections for months throughout 2014. The mainstream media kept trying different angles on it. Then by the end of the year they switched from Measles to Ebola and gauged everyone's reaction on that. Before you knew it they employed Hollywood celebrity mocking "anti-vaxxers", funded several "pro-vaccine" campaigns and the rest is history. So don't be fooled by subtle seemingly innocent stories about a new "report" that suggests that organics food recalls are up and how "serious" this is. This is just propaganda from the same people who have given us many other recent "studies", new "data", and "reports" always spinning the narrative sometimes slowly, sometimes more aggressively toward the profit of choice. We should all be aware by now that essentially all scientific research of medical claims are absolutely "untrustable and fraudulent". Especially when we observe the synchronistical spread of these study results by the mainstream media only to later on observe that these study conclusions seem to always have political or corporate profit ramifications. So nothing should surprise us from the empire that tells us that a "new study" shows cancer is just "bad luck". Or that everything needs to be genetically controlled instead of considering the environmental factor like eating healthy and pursuing a healthy lifestyle so that you can minimize your trips to the doctor and not waste so much money on hospital bills. Eating healthy I believe is the most important thing you can do to dump doctors and expensive tyrannical medical-hospital systems out of your life. Health begins during conception, continues after birth and then throughout your life. This is why it is so important to avoid anything that is unnatural as much as possible. Don't let a multi-trillion dollar vaccine maker or pharmaceutical company tell you their GMO food, drug or vaccine is "safe". They only tell you that because "safe" claims means trillions $$ of dollars for them especially if they can get government to force you to take their product. Aside from pursuing personal health as a token of self ownership and self-responsibility, let's continue to pursue solutions in the form of inter-dependence. Share health knowledge with one another and help make healthy foods available to one another. If you can now is the time to grow your own food and become familiar with what medicinal values organic foods have. The most important goal is to boost your immune system and thus strive to make government's medical tyrannical system obsolete since many diseases are based on functional compromise of the body and a depleted, improperly working immune systems. I believe doctors including many medical doctors will eventually go to where the demand is, given that most of them are well meaning and in their hearts are committed to evidence-based medicine. Many of them will begin to see the greater agenda at play and there are many signs this is already happening. Ultimately, health is an individual thing and there is no other topic that requires self accountability and responsibility than your own health. As always it starts with you. Eating healthy organic food is one of the easiest and most powerful and effective things people can do to start dumping the control system. It's no wonder they are slowly preparing their propaganda for what appears to be a long but eventually losing battle.